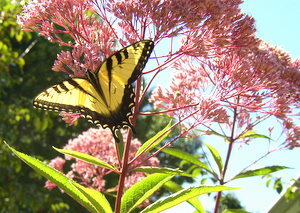 Joe Pye Weed is a stunning plant for your butterfly garden. It will definitely draw people’s attention simply by its size, but also its beauty. It is very easy to grow and butterflies are attracted to the plentiful nectar it produces...especially Monarchs and Swallowtails...two of our largest species here in the U.S. and Canda. There are several species of this plant, but the most common is the Eupatorium Purpureum. Since this is such a large species (right plant in photo, which is not even full grown), placement should be in the back of your border. In an island bed, place it toward the center. Make sure and leave plenty of room for it to grow. Eupatorium Purpureum transplants easily after it is established if you would like to share some with fellow gardeners. 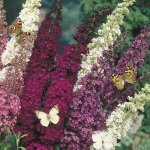 Here are seeds and plants available for purchase of this top butterfly flower. 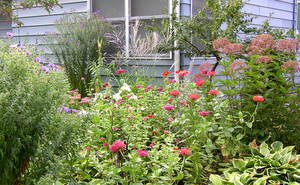 Joe Pye Weed is said to have gotten its name from a Native American Indian, Joe Pye, who used the plant to cure Typhus. Tea made from this plant is used as alternative medicine for fever, urinary tract problems, rheumatism...among other things. Dried, burned leaves are said to repel flies. Hollow stems have been used for straws. The word Eupatorium comes from the Greek King of Pontas, Mithridates VI Eupator (132-63BC). He used one species of this plant as an antidote for poison. Purpureum comes from the Latin word for “purple”.